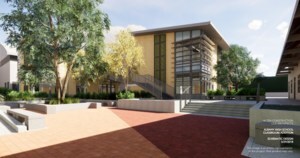 The schematic design phase for the Albany High School Addition has been completed. The Albany High School Addition design committee has been working with the Alten Construction / LCA Architects design/build team to refine the original design. Meetings through the month of March have resulted in the finalized schematic design. The attached presentation was presented to the Board of Education at the April 3, 2018 meeting. * Please note that all renderings and the design depicted in the video are artistic representations of the project as it is designed at the current time. The design will evolve as the design process continues. The actual finished project may differ from these renderings.